What Is an MRIMG File? A file with the MRIMG file extension is a Macrium Reflect Image file created by the Macrium Reflect backup software for the purpose of storing an exact copy of a hard drive. An MRIMG file may be built so that the files can be restored to the same drive in the future, so that you can look through the files via a virtual disk on a different computer, or to copy all the contents of one hard drive onto another. Depending on the options that were selected when the MRIMG file was created, it may be a full copy of a disk that includes even the unused sectors, or it might just hold the sectors that contained information. It may also be compressed, password protected, and encrypted. MRIMG files that are Macrium Reflect Image files are created and opened by Macrium Reflect. You can do this through the Restore > Browse for an image file to restore... menu option. From there, choose Browse Image if you just want to mount the MRIMG file as a virtual drive so as to look through it and copy out specific files/folders that you want to restore. You could also mount the MRIMG by right-clicking (or tapping+holding on touch screens) the file and choosing Explore image, or even using Command Prompt (see how here). Dismounting an MRIMG file can be accomplished through Macrium Reflect under the Restore > Detach Image menu. To actually restore the contents of the MRIMG file back to their original location instead of just browsing through the virtual drive, pick the Restore Image option to choose the destination. You can not make any changes to the files that are inside an MRIMG file. If you're mounting it as a virtual drive, you can copy files out and even temporarily make changes to them (if you choose to make it writable), but none of the changes are sustained once you unmount the file. 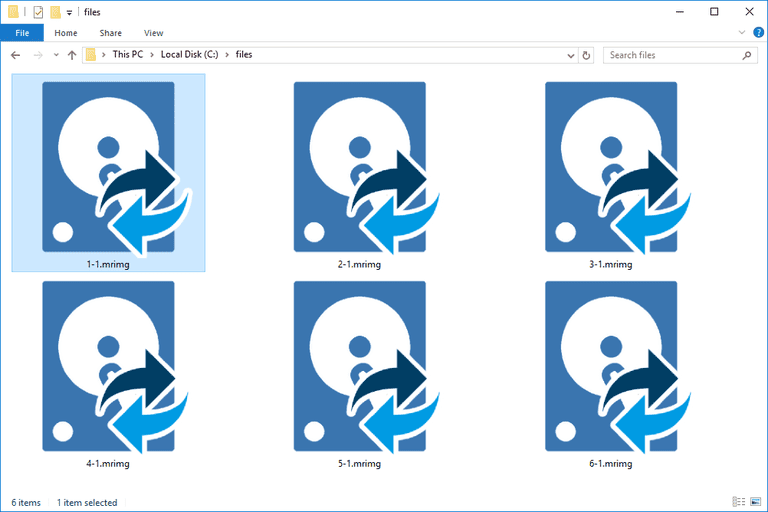 If you find that an application on your PC does try to open the MRIMG file but it's the wrong application or if you would rather have another installed program open MRIMG files, see our How to Change the Default Program for a Specific File Extension guide for making that change in Windows. You can convert MRIMG to VHD (Virtual PC Virtual Hard Disk file) using Macrium Reflect in the Other Tasks > Convert image to VHD menu. If you want the VHD file to then be in the VMDK format for use in VMware Workstation Pro, or in the IMA disk image format, you may have luck doing that with WinImage through its Disk > Convert Virtual Hard Disk image... menu. Some Macrium Reflect users may want to convert their MRIMG file to an ISO file, but that's not really the step you should take. If what you're after is a way to restore an MRIMG file that doesn't seem to restore properly (maybe because Macrium Reflect can't lock the hard drive), you'll want to instead create a bootable rescue CD. See Macrium's Create a Bootable Rescue CD directions for how to do that. One of the simplest reasons for why a file won't open with a program that it should clearly work with, is because the file isn't really in a format that's supported by the program. This might be the case if you've misread the file extension. For example, at first glance, the MRML file extension looks a lot like it says MRIMG, but MRML files will not work with Macrium Reflect. MRML files are actually XML-based 3D Slicer Scene Description files created and used by 3D Slicer to render 3D medical images. The best thing to do if you've tried all of the above to mount or open your file, is to make sure that it's really an MRIMG file. If it's not, then research its actual file extension to learn which programs can be used to open or convert it.